It’s thankfully rare these days that the special effects can distract from a film, and it’s a pity in this case because there is a lot to like about Alita: Battle Angel. The world in which it is set is intriguing, the characters are reasonably well written and director Robert Rodriguez certainly knows his way around an action scene. Unfortunately, however, we saw this film in 3D. This is something I usually try to avoid but, this time, forgot to check. This meant that I had to try and balance a pair of 3D glasses over my normal glasses which is not comfortable and which, for the first few minutes of the film, put me in the dilemma of either watching the film in slightly blurry 2D or potentially inducing a headache. I eventually managed to get everything lined up well enough to watch the film but it’s a mildly annoying faff as the 3D doesn’t really add anything. A more serious problem is with the character of Alita herself, played by Rosa Salazar. Alita is a cyborg and, presumably to emphasise this, Salazar’s appearance has been digitally manipulated — most noticeably to enlarge her eyes — to give her a more ‘manga’ look. Unfortunately, this put the film into uncanny valley territory and, on several occasions, left me with the feeling that she had been pasted into the film. Given this, I think it’s a testament to Salazar’s performance that the character didn’t become completely disconnected from the rest of the film. The film is set in the 26th Century, some 300 years after a devastating war, and society has become pretty dystopian. Dr. Ido (played by Christoph Waltz) finds the remains of a cyborg in a pile of junk ejected from Zalem, the floating utopia that hovers above the much more downbeat Iron City in which he lives. Dr. Ido salvages these remains, fits her with a cyborg body and gives her the name Alita. Inevitably, Alita has no memory and must, therefore, find out who she is, where she came from and why she is so proficient at a long lost martial art. This could have become quite ponderous, but Alita is such an enthusiastic character that you just can’t help warming to her — especially when she finds herself up against Iron City’s multiply bladed hunter warriors. And then there’s the Motorball, the sport of Iron City. Think Rollerball re-imagined as a free for all, with cyborgs. Motorball is quite thrilling to watch and becomes an increasingly significant part of the plot as the film progresses and Alita becomes more focussed on what she must do next. 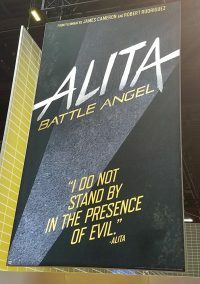 Alita: Battle Angel is an ambitious film and one that pushes the limits of motion capture technology in order to lift the central character directly from her manga origins and onto the screen. Even when it doesn’t quite hit the mark, the film works as a thoroughly entertaining SF action film, packed with spectacular action sequences and some very strong performances that make even the hokiest dialogue sound believable. The film’s ending clearly sets it up for a sequel. I hope this gets made. hails from Japan, where the successful manga spawned a 90s anime adaptation. It tells the story of a cyborg heroine, Gally, who’s rescued from a scrapheap by a kindly scientist. A confused innocent in a violent cyberpunk world, Battle Angel follows the athletic heroine as she searches for the secret of her own past. The film is directed by Robert Rodriguez and produced by James Cameron, who also has a writing credit. The first trailer is out and it looks really stunning. CGI heavy films often suffer from the Uncanny Valley effect, but if the trailer is anything to go by, it looks like Cameron and Rodriguez have solved that problem spectacularly.